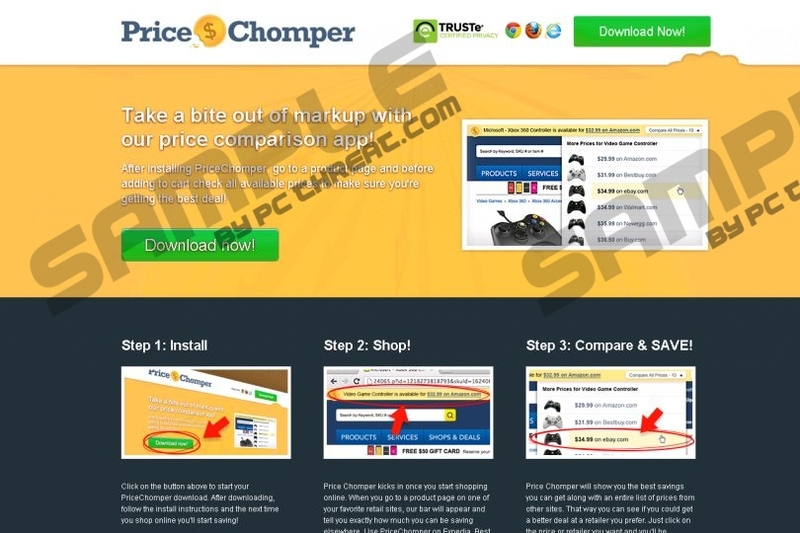 PriceChomper may sound like an application that can help you cut your expenses while shopping online; however, it is nothing but another useless and annoying adware application. Although PriceChomper claims that it will make sure you get the best possible deal when buying products, what it really does is fill your screen with lots of third-party advertisements. This adware can seriously ruin your web surfing experience, not to mention the potential security threats it holds. As a matter of fact, PriceChomper may not even be the only infection to worry about. Since it is most likely that you have been infected with this adware via a freeware bundle, you might have other threats already silently breaching and infecting your system. All in all, if you do not want to expose your system and privacy to potential harm, it would be best to remove PriceChomper as soon as possible. PriceChomper tries to do everything to convince you that it is an authentic and useful application; it even has an official website, pricechomper.com, which has one single fault: the download buttons do not work. So, practically, the developer, Engaging Apps, designates a website to a product that cannot be downloaded. That may be the first red flag that makes this application a questionable or suspicious one. Our researchers have also found that PriceChomper is identical to Price Slayer and ProShopper apps, which we have written about. These adware applications are mostly distributed in free software packages that you can download from untrustworthy file-sharing websites, where they are promoted. Users need to be very cautious when installing such a bundle and pay attention to the steps in the installation wizard. Most people go for quick installation and ignore the opportunity to say no to certain unwanted programs that want to sneak onto their systems along with the free software. If PriceChomper is on board, it is advisable to run a full system scan to detect other possible threats too. In order to keep your system clean, you should delete PriceChomper and all the additional infections. PriceChomper fills up your screen with different types of third-party ads, including pop-ups, pop-unders, banners, and sponsored links. This adware may also record some data about your browsing habits, such as products you are interested in, websites you visit, ads you click, and your IP address. Third-parties can make great use of the profile that is based on this data and send targeted advertisements to your screen. While some might think it is a great thing to have best deals and other ads to choose from, we recommend that you refrain from clicking on any of these ads. The truth is that nobody can warrant the content, reliability, and safety of those third-party websites where you will be redirected once you click on an ad. Therefore, you might end up on an infected website and expose your system to multiple malware attacks. We hope that it is clear now why we suggest that you delete PriceChomper right now. If you want to get rid of PriceChomper, you need to uninstall it via Control Panel and remove the extensions from all your browsers, including IE, Mozilla Firefox, and Google Chrome. We have prepared a guide for you below, which will help you with the whole process. But, even if you manage to completely remove PriceChomper, there is a chance you still have other threats hiding on your computer. In order to feel safe about your PC’s security, it is best to run a full system scan using a reliable online scanner to detect the remaining infections. If the scanner reports the presence of malware, it is advisable that you install an authentic antispyware program to delete all the necessary files and safeguard your system from future malicious attacks. Tap Win+R and type in control panel. Click on PriceChomper to select it and click Uninstall. Remove the unwanted extension from the list. Access the Tools menu and select Add-ons. Remove the undesirable extension from the list. Double-click on the unwanted extension and click Remove. Quick & tested solution for PriceChomper removal.